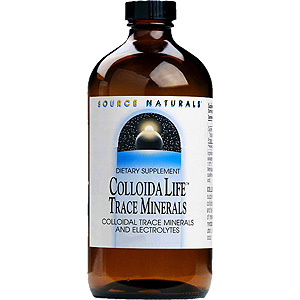 ColloidaLife supplies 72 trace elements in a balance of colloids and ionic electrolytes. 1/10 of 1% methylparaben, widely accepted for its antimicrobial qualities, has been added as a preservative. Methylparaben is a derivative of PABA, (para amino benzoic acid). The key to formulating colloidal trace mineral supplements is found at the molecular level. Colloids are particles in a solution that are completely dispersed and will not settle out. Many trace mineral products are just water leached through mineral deposits, and contain high levels of undesirable minerals. COLLOIDALIFE is prepared through a proprietary process whereby 20 minerals are individually prepared as colloids. These USP grade minerals are then blended with 52 charged ionic mineral electrolytes derived from highly purified ocean water. This ionic solution strengthens the net surface charge of the colloidal particle, creating a more stable colloid. The trace mineral electrolytes in COLLOIDALIFE are present in extremely small, but optimal quantities that prevent the colloids from precipitating out. Because the ionic matter is easily absorbed and is highly reactive in the body, only trace amounts of the different electrolytes are needed. COLLOIDALIFE therefore provides protection from possible deficiencies while avoiding the possibility of toxicity. The minerals in COLLOIDALIFE emulate the way minerals are carried in the blood and used by the cells: colloidal particles suspended in ionic fluid. Sea water - except for its higher salt content - has a mineral profile very compatible to that of the body's three fluid systems: blood plasma, lymphatic, and extra-cellular. This similarity underscores our intimate connection to the earth and its oceans. Neutral in taste, Source Naturals COLLOIDALIFE can be held under the tongue for sublingual absorption, or swallowed directly. COLLOIDALIFE is the perfect solution to compensate for a mineral-poor diet that may be limiting your ability to enjoy a healthy and vital life. Source Naturals ColloidaLife Trace Minerals are suitable for vegetarians and HYPO-ALLERGENIC: contains no yeast, dairy, egg, gluten, corn, soy or wheat; contains no sugar, starch, or artificial color, flavor or fragrance. 1/2 teaspoon of ColloidaLife Trace Minerals twice daily. This Trace Minerals product can be held under the tongue or swallowed directly. Warning: If you are pregnant or breastfeeding, consult your health care professional before using Colloidal Minerals supplement. Colloidal Minerals: Boron, Calcium, Chromium, Copper, Iodine, Iridium, Iron, Lithium, Magnesium, Manganese, Molybdenum, Phosphorus, Potassium, Rhodium, Selenium, Silica, Silver, Sulfur, Vanadium, and Zinc; plus 52 electrolytes from purified sea water including Gold, Palladium and Platinum. ColloidaLife Trace Minerals is shipped in a discrete, unmarked package. Orders are processed immediately and usually take about 3 to 5 working days to be received. We do ask that you try it for 2 to 3 weeks to feel the full effects. Any information received is used only for order processing and shipping purposes. Your information, such as e-mail address, will never be disclosed to a third party.